Review by AllTheBestFights.com: 2018-11-30, fight not particularly good between Daniel Weichel and Goiti Yamauchi: it gets two stars. The black belt in Bjj and former M-1 Global Lw champion Daniel Weichel entered this fight with a professional mma record of 39-10-0 (69% finishing rate) and he is ranked as the No.16 featherweight in the world but he comes off the loss against Patricio Freire (Patricio Freire vs Daniel Weichel); before this bout, in 2017, he had beat John Teixeira da Conceicao (Daniel Weichel vs John Teixeira). His opponent, Goiti Yamauchi (black belt in Bjj as well), has an official record of 22-4-0 (86% finishing rate) and he entered as the No.54 lightweight. He has also fought and lost once in 2018, against Michael Chandler (Michael Chandler vs Goiti Yamauchi) and he had fought and won once in 2017 beating Adam Piccolotti. 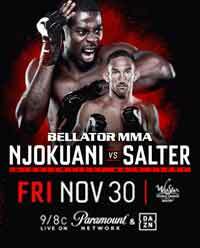 Weichel vs Yamauchi is on the undercard of Chidi Njokuani vs John Salter – Bellator 210. Watch the video and rate this fight!